There’s a huge advantage that niche players have over larger companies who try to be all things to all people. The first, and most obvious, is focusing on solving one problem really, really well. This means that typically you are best placed to solve that problem for many organisations who find it a huge pain point. Another advantage you have is how agile you can be with your sales and marketing. You can see what the larger, more established and challenger organisations are doing and manoeuvre accordingly. On the flip side, the biggest challenge is getting the attention of the C-Suite and other senior decision makers within markets where those larger players have already established trust. It’s this kind of trust that you yourself need to gain on order to see success. Most marketers and sales teams start by presenting what they do, outline the benefits and then establish a business case. It’s assumed that, by doing all this, trust can be established. When selling to the C-Suite, you need to reverse the order of this process. As we’ve stated in the past, senior executives only spend 2% of their time with vendors, so you must establish trust in advance. As we outline in our eBook, the C-Suite is more inclined to doing business with people they already trust. This means that you need to build a relationship based on TRUST and VALUE before ever trying to sell to them. In this article, we’re going to outline a 3 step process that you can use to build relationships based on intimacy with senior decision makers. This is the same process that companies such as NetSuite, SAS and Thomson Reuters use to engage with C-Suite executives and secure large sales pipeline. As I mentioned above, most people start their message or pitch with what their solution is and move onto the benefits. Unfortunately, the C-Suite doesn’t care about this. They care about the issues that are pressing to them and how they can be solved. They care about what you can bring to the boardroom, not the intricacies of your product or service. The question is, how do you find the challenges these senior executives face – the ones that really hit them in the gut – and how can you tie it closely with your value proposition to remain relevant throughout the relationship? In order to apply the SCQA methodology effectively, you must start with the ANSWER. We do this because this is directly tied to your own value proposition. The goal is then to find the QUESTION that connects the big challenge your C-Suite audiences face with your value proposition. So, once you have the ANSWER, start outlining the SITUATION, then the COMPLICATION in order to get to the connecting QUESTION. 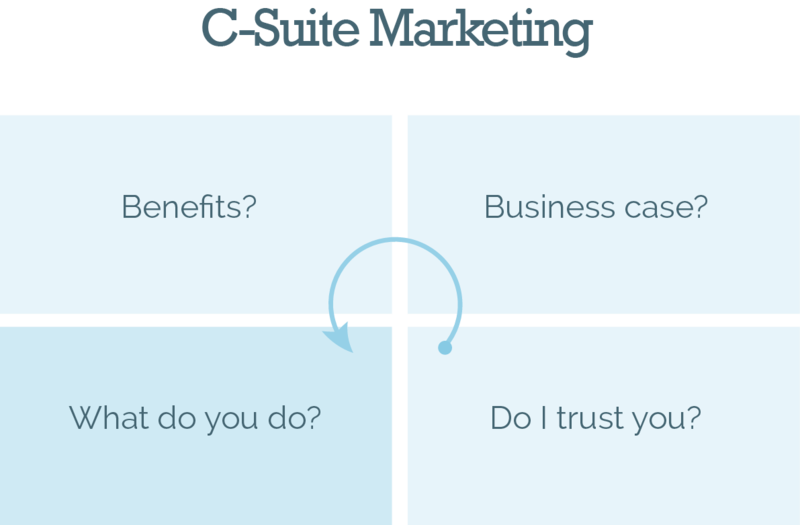 This is the message framework that you’ll use when reaching out to your C-Suite audience. It will inform the content you create and the kind of value you’ll deliver in the next two steps of the process. 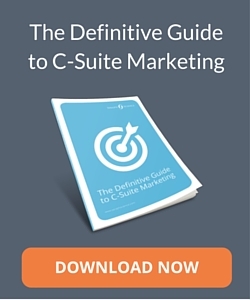 As I mentioned earlier, the C-Suite spends only 2% of their time with vendors. Even when your message is being driven by your audience’s challenges, you’re still coming from the stance of a vendor by communicating through your brand. So how can you get around this? The most important time to engage with the C-Suite is right at the moment you don’t want to. As business people, we’ve been taught to only target those who need our product or service right now. However, just as you learn who your real friends are when the chips are down, the same is true for the C-Suite. Because of this, you need to be marketing to them all the time. You need to extend beyond the typical buyer-seller dance in order to stay connected with senior executives in your target accounts. That means building a relationship even when a particular C-Suite executive doesn’t need what you want right now. The most effective way of doing this – and the only way that has worked for us and our clients time & time again – is by creating an independent brand. We create this independence in the form of a club. 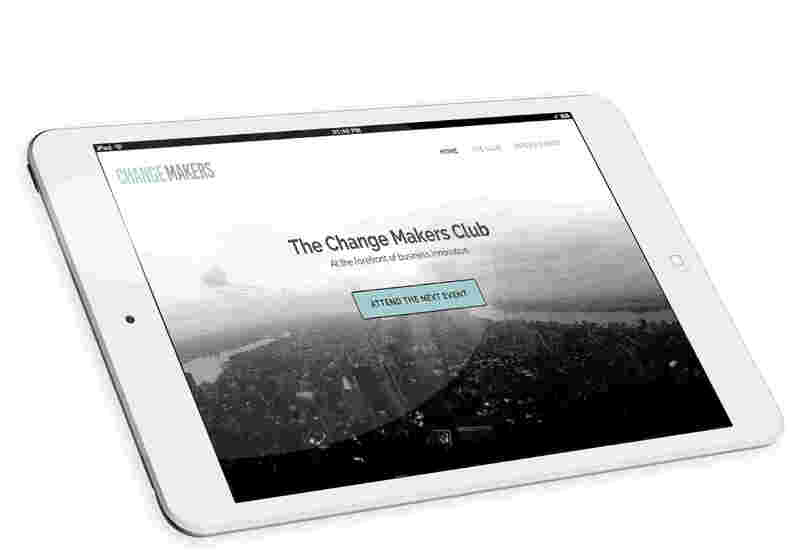 These clubs act as a great platform for your SCQA message because they exist only to deliver value and bring the peers of your C-Suite audience together. You remove your vendor positioning and instead exist solely to provide useful content and to act as a connector. The purpose of being a connector is just as valuable as the content that you deliver through the club. It gets awfully lonely at the top, and the C-Suite rarely have their decisions questioned internally. When they get together with their peers, they have an opportunity to have their assumptions challenged or confirmed. This is invaluable to a senior decision maker who is looked upon as a leader on a daily basis. Of course, you now need a platform to bring them together in. This is where the face-to-face element comes in – a key component to building intimate relationships with senior decision makers. You can’t build intimate relationships through digital platforms alone. Sure – email, LinkedIn messages and the like are great catalysts but they won’t solidify strong, lifelong relationships with C-Suite executives. In order to bridge the gap between first contact, awareness and sales opportunities, you need to add a face-to-face element to your club. This is, in essence, the entire purpose of creating the club in the first place. There is one huge mistake that many people make when marketing to senior execs, and it’s in this step that it usually affects the process. Think about your own organisation: when guiding a prospect through your sales cycle, do you have one person leading them from start to finish, or is the process fragmented from resource to resource? Most organisations break the cycle down by resource. They’ll have one person reaching out, who hands it to another person for qualification, and then another to make the pitch. From a C-Suite perspective, this comes across as tactical and lacks integrity and authenticity. From this “stitched together” funnel, all the senior exec sees is an unintegrated set of touch points across email, social media, face-to-face and over the phone. Information gets lost along the way, which happens a lot more often than you might expect, and this causes the relationship that you’ve worked so hard to build with the C-Suite to corrode away until eventually you fall into their “ignore” bucket. Therefore, you must have one person guide the executive from start to finish. They should be send the initial emails and be there to greet them. Which is where the dinner comes in. 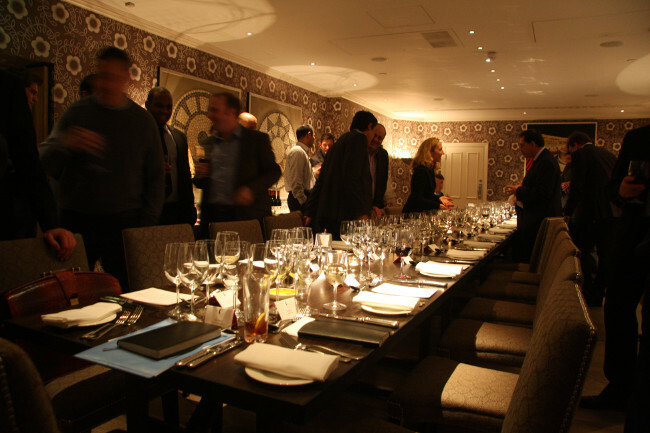 Dinners are the environment of choice when bringing C-Suite executives together in a room with us and our clients. We don’t use lunches or breakfasts, and we certainly don’t use exhibitions or conferences. If you want to accelerate the process of building an intimate relationship with senior people then you need to get them when their working day is over. In the evening, their mindset will switch from “operational activities” to a strategic way of thinking. At this time they’re able to relax and will be more open to looking at the bigger picture. Once you have them in this environment, you can help them discuss about their current challenges and show them how others have overcome it. How do you do this? You invite your clients to the dinner too. This way you’re showing that your solution is best suited to help them overcome their challenges using third party endorsements. 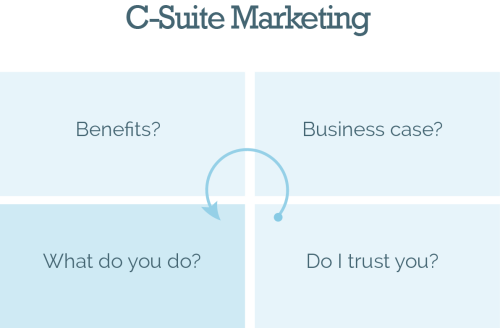 Although we’ve only scratched the surface of the C-Suite marketing methodology, this top-down view should give you a better idea of how senior executives operate and the way you should be engaging with them. The importance ultimately lies in understanding how they value their time and what it takes to build intimate relationships with them. The vehicle for this is in positioning yourself as an independent brand that exists to serve them and their peers.